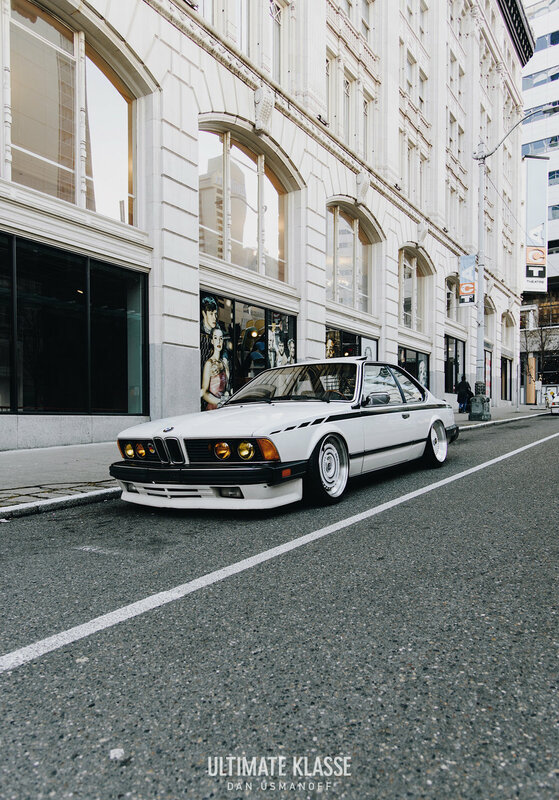 Jonny’s E24 is one of the most unique examples that I’ve seen in awhile. When it was first unveiled on the internet, it immediately caught my attention. It’s so clean, but full of character at the same time. All of the small details flow really well to create a look that I’ve not really seen done before. It’s got the perfect blend of stance and vintage motorsport with a style I would expect to see coming from Japan. 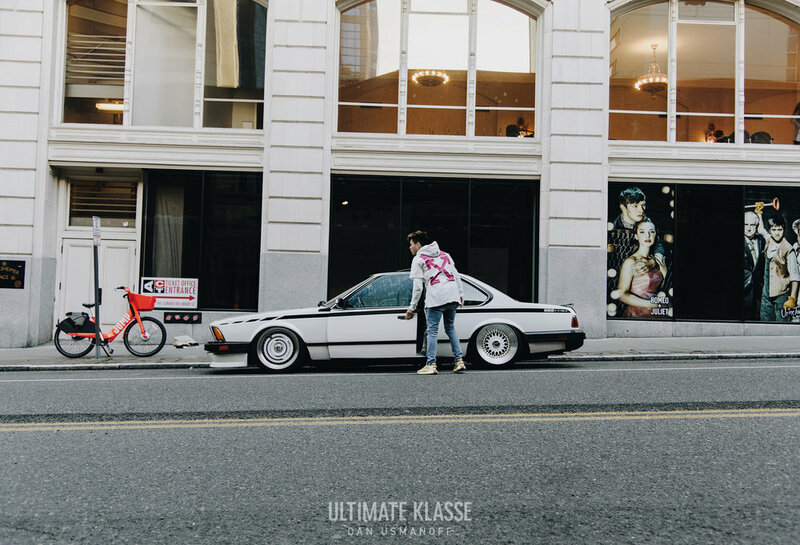 Jonny used to have an E36 convertible that was distinguishable as well. He eventually sold it with plans to later obtain his (affordable) dream car. 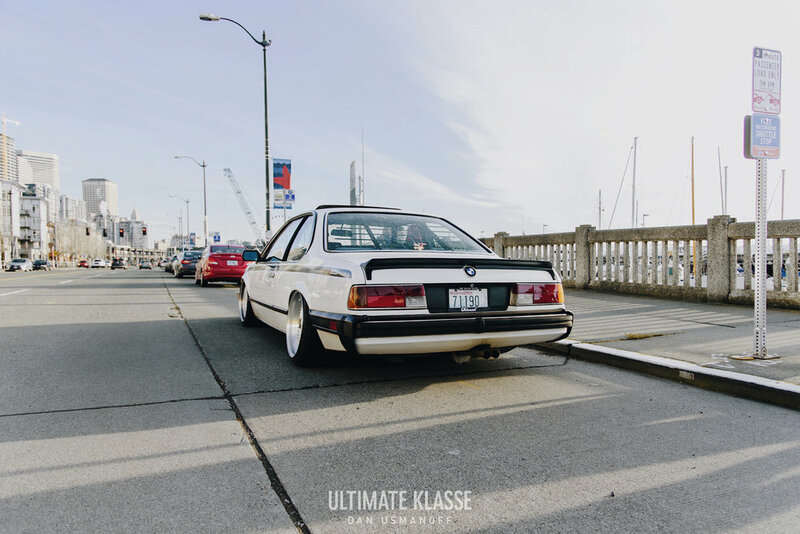 The first generation of 6 Series, the E24 was BMW’s flagship coupe of the 80’s. 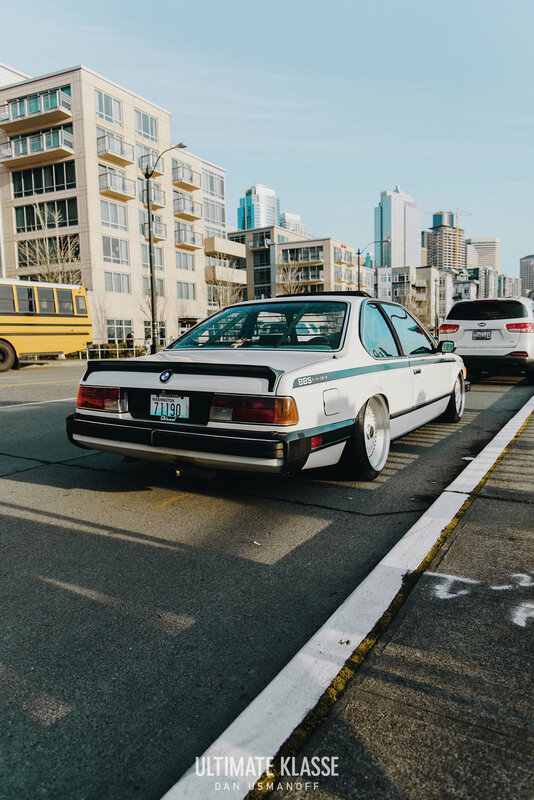 Jonny’s 1987 635csi has 255k miles on it, but visibly shows little aging. 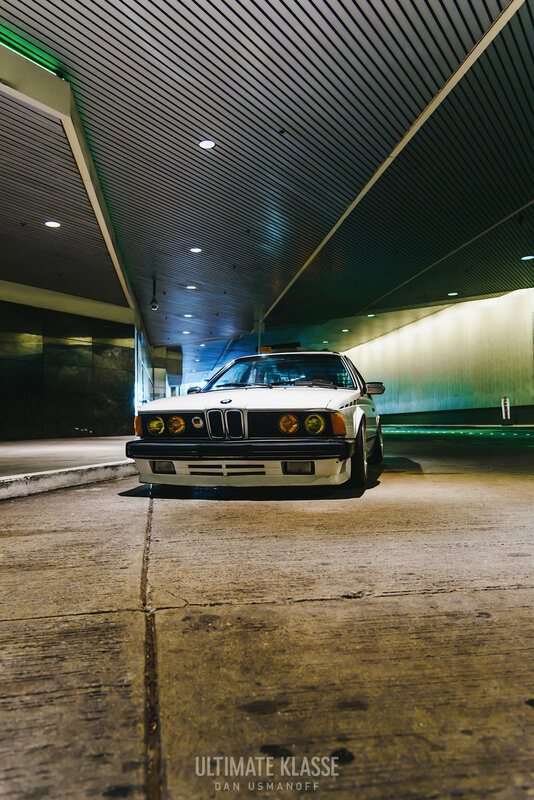 He bought the car a year ago and originally wanted to make it his daily driver. 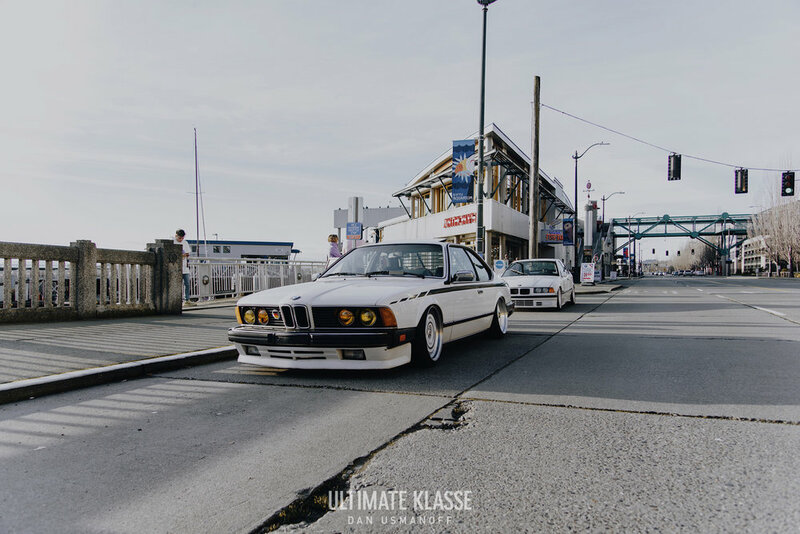 At the time he was dailying an M4, so the goal was to fix up the E24 and make it reliable. The M4 was sold so it was time to fully focus on the 635. The first thing that needed addressed was the transmission, which was on its last leg. He found a good deal on another automatic transmission and had that installed. 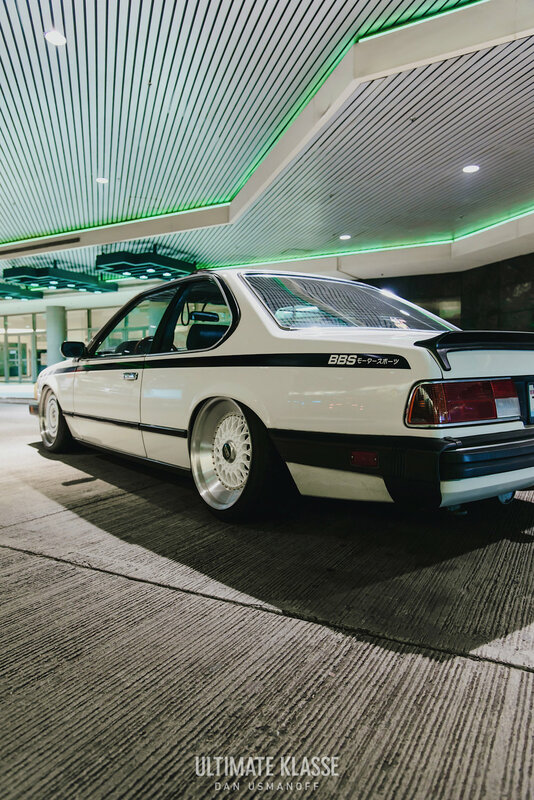 Once that was done, all he wanted to do was maybe throw on some sport springs and M-Parallels and call it a day. 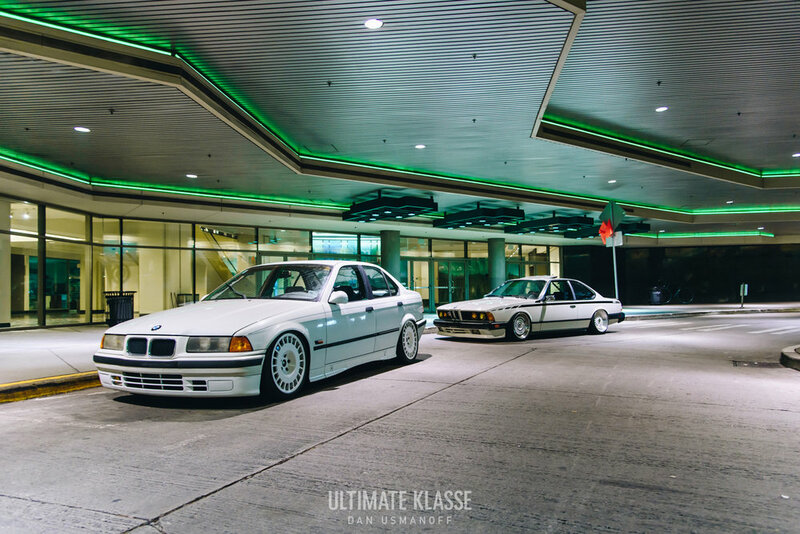 Since his E36 was on air it was an option that he took into consideration. 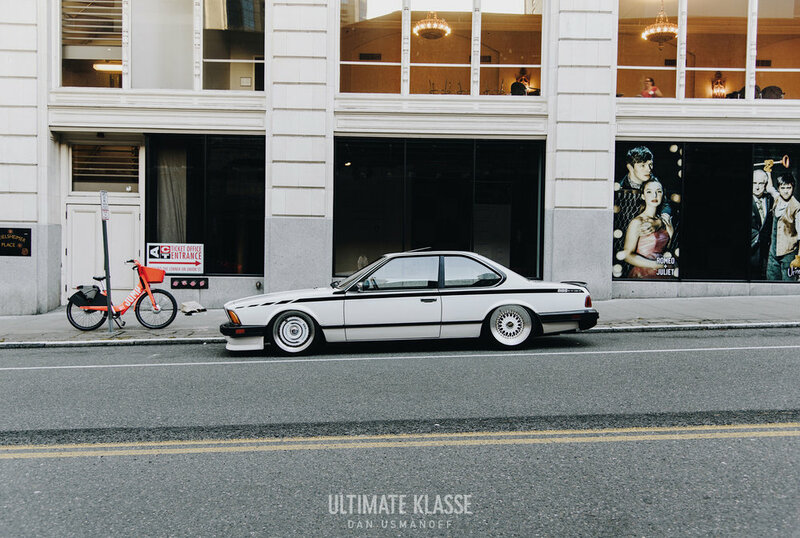 After seeing a few great examples of bagged E24’s out there though, it proved to be the winning solution. 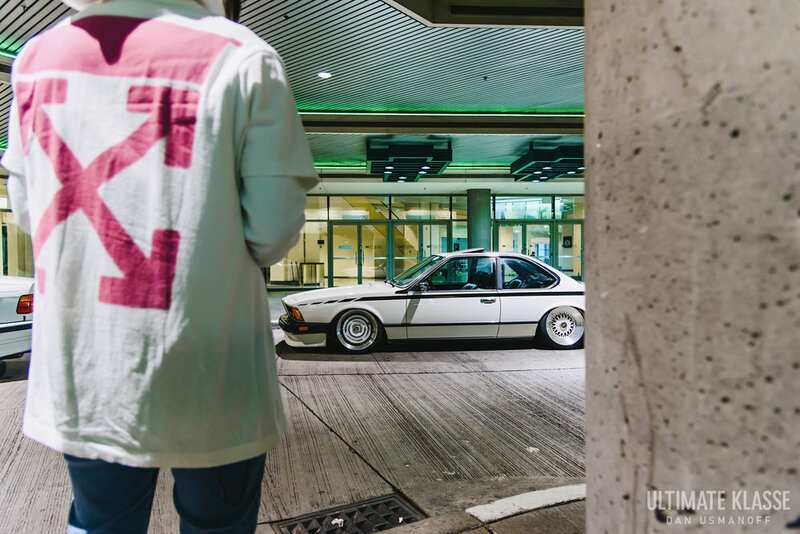 Brendan Stouffer’s @b_stouffs and Alvin Louie’s @nicmosh cars convinced Jonny to pull the trigger. He went with CAtuned’s airbag kit with Bag Riders management. Group 2 Motorsports did the install, so it was time to dial in the wheels. 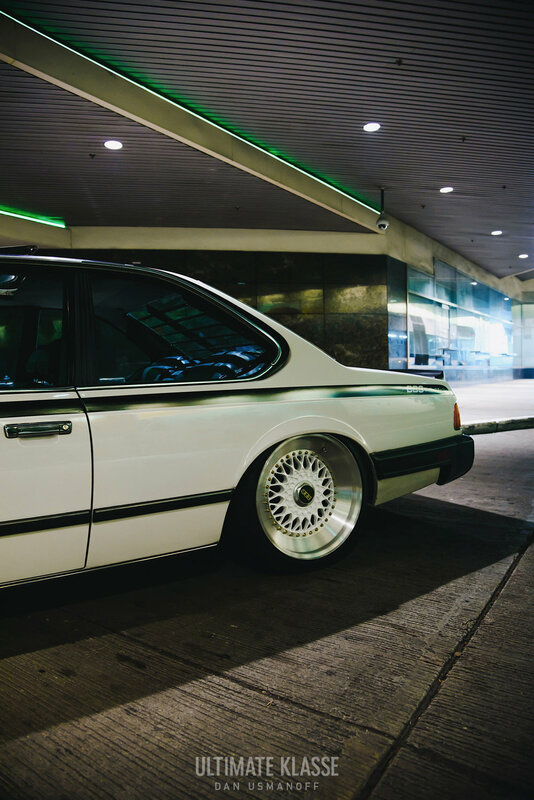 Jonny worked with Austin Seeling @austin_8p to build a set of BBS RS’s. 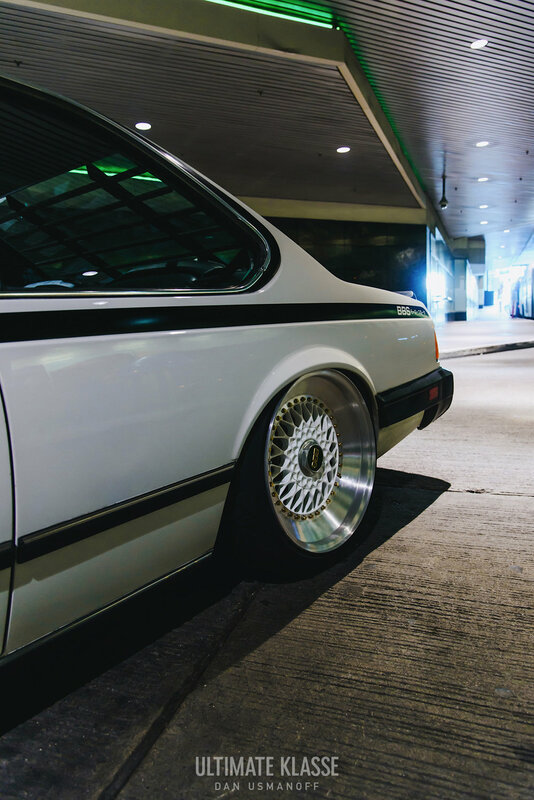 They went with 18x9” fronts and 18x10” rears with slant lips. The turbofans on the front wheels were custom designed and printed by Austin, originally meant for his Audi last year. He wanted to create something different than you usually see. 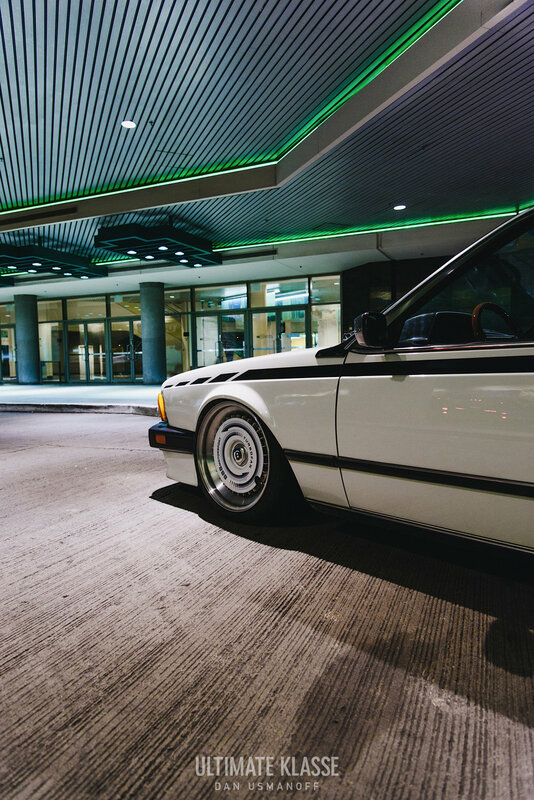 The vintage BMW Motorsport center caps were a nice touch as well. Typically my excessive preference for things to be symmetrical or matching would cause me to not fully enjoy seeing two different wheels on the car. But it actually works really well and make sense with the overall theme somehow. It’s one of the details about the car that helps make it so unique. One of the other details that really made this car was the side graphic designed by Austin. 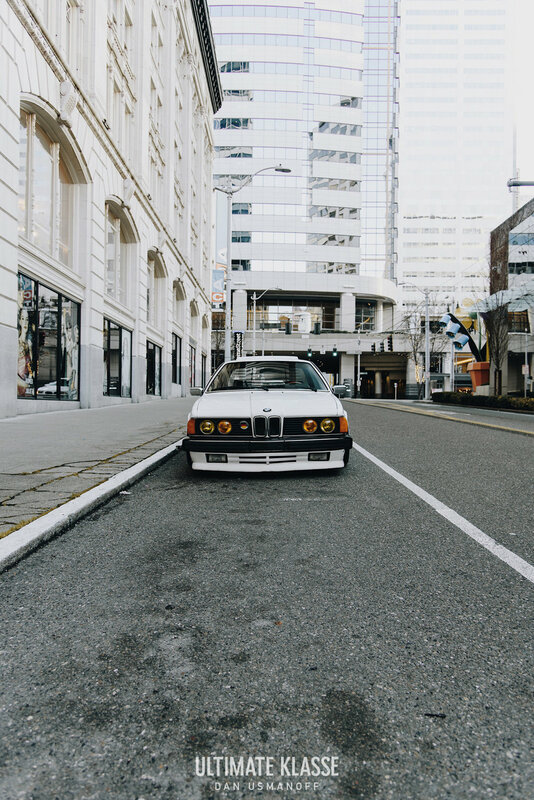 The stripes were originally going to be the same style as the ones found on Austin’s E28. 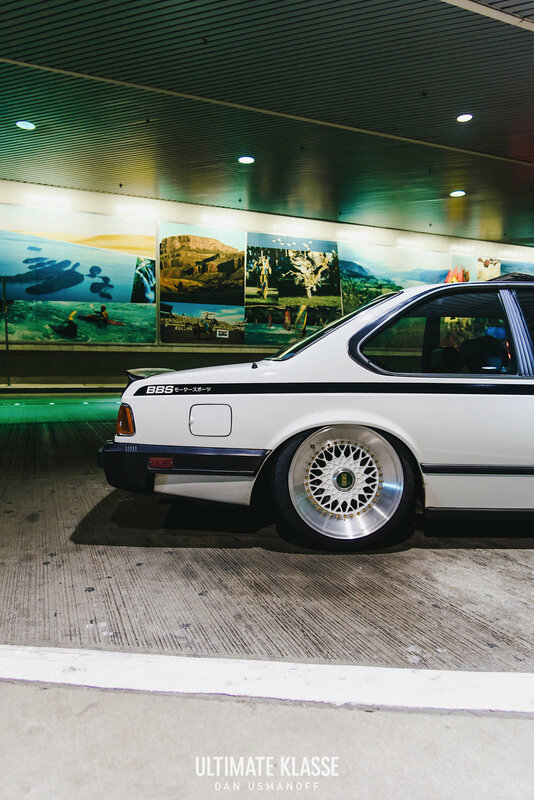 However he decided to design something new to flow better with the E24’s body lines and overall look. 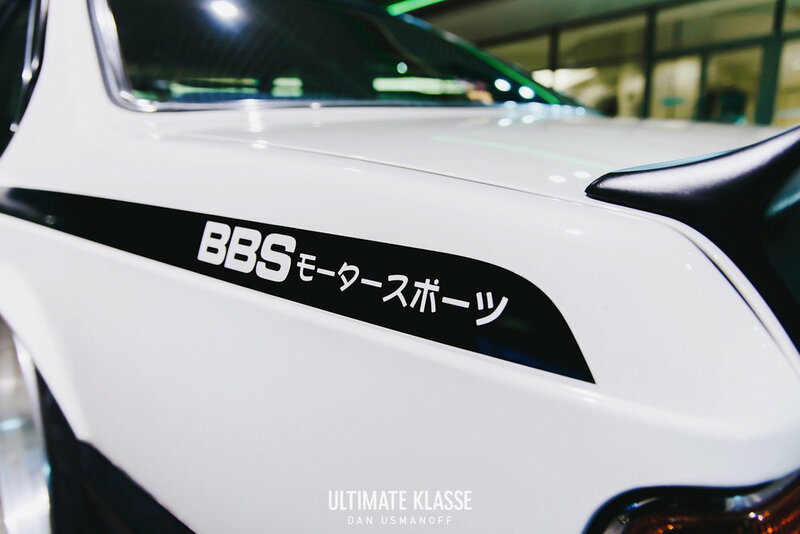 On the rear quarter panel is the BBS logo and Katakana characters which translate to “Motorsports”. The graphic is one of Jonny’s favorite parts of the car and I completely agree. 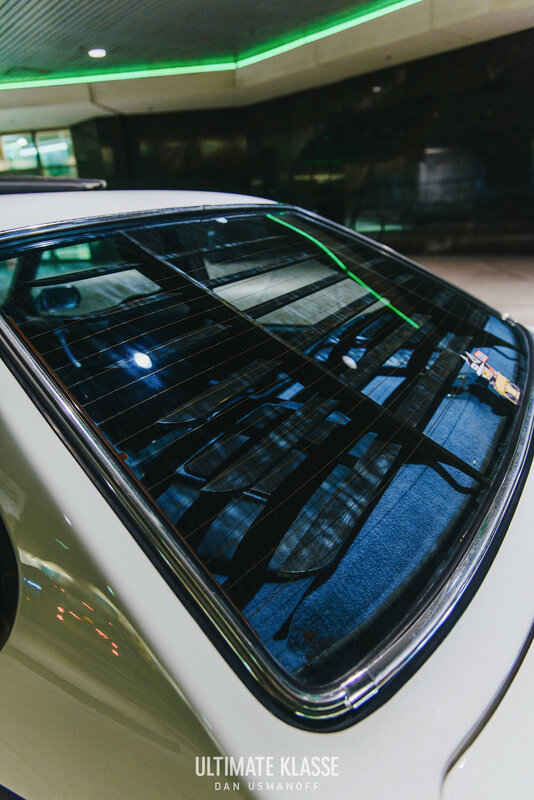 Another mod that may at first go unnoticed is the custom rear window blinds handcrafted out of wood by Austin. He took some measurements and cut them with a scroll saw in his garage. 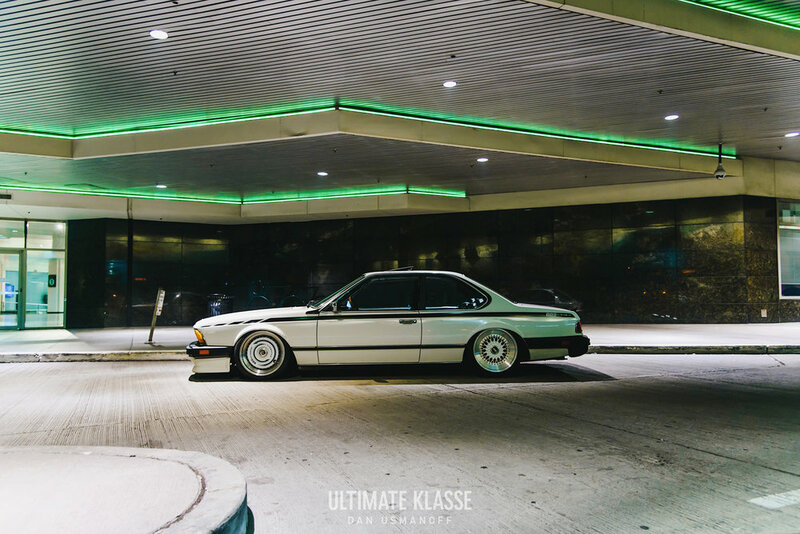 Once the fitment was perfected he finished them off with a torch to give them the black look. Jonny said now that the car is where he wants it, the next step will be to swap a manual transmission into it. Other than that and getting euro bumpers it’s done. 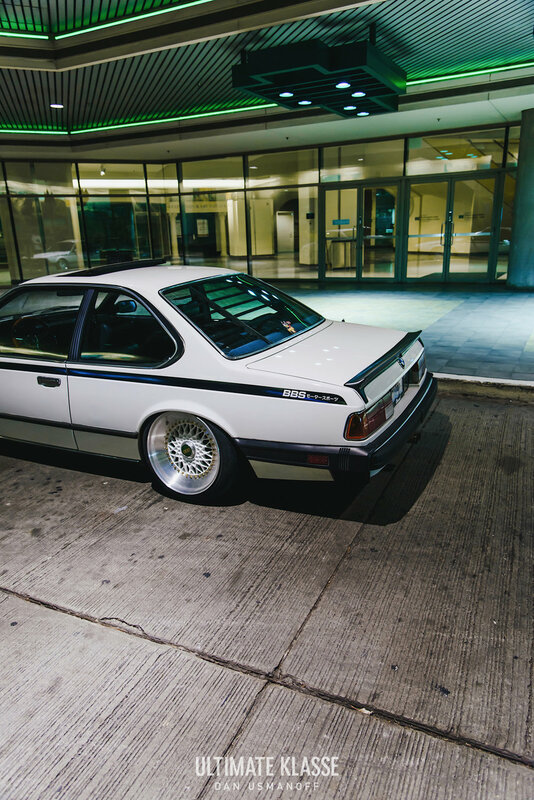 I’m glad that he didn’t just stop at wheels and a sport drop, because this is one of my favorite cars ever. 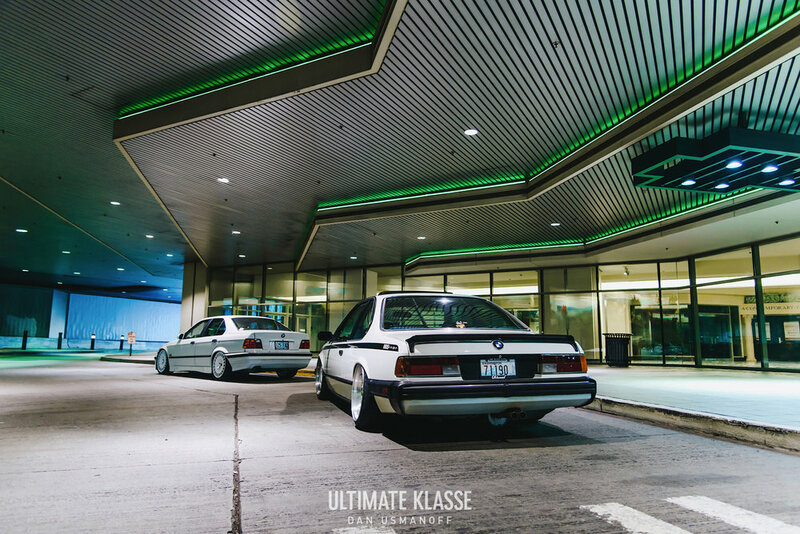 It surely sets the bar for how nice you can make an E24 look.